Recently, SMBH has been consistently writing, recording and performing. Late 2012 saw the release of a new EP. A four-track nibble of what is ultimately coming in 2013 – a debut full length. 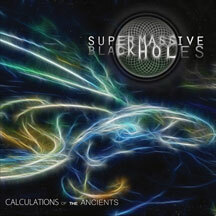 Calculations of the Ancients is the debut full-length album from Canadian death metal experimenters, Super Massive Black Holes. Blending Prog, Jazz-fusion, and other styles into melody-laden Death Metal, the intent was to connect many types of music together into a fused sound.